Hayward Swim Clear C4025 Cartridge Filter for In Ground Swimming Pools. The Hayward Swimclear utilizes a cluster of four reusable cartridge elements, SwimClear filters offer a choice of 225, 325, 425 or 525 square feet of heavy-duty dirt-holding capacity for extra-long filter cycles, up to an entire season without cleaning. The filter tank is constructed of improved PermaGlass XL material, SwimClear filters will provide years of trouble-free operation and crystal clear, sparkling water. 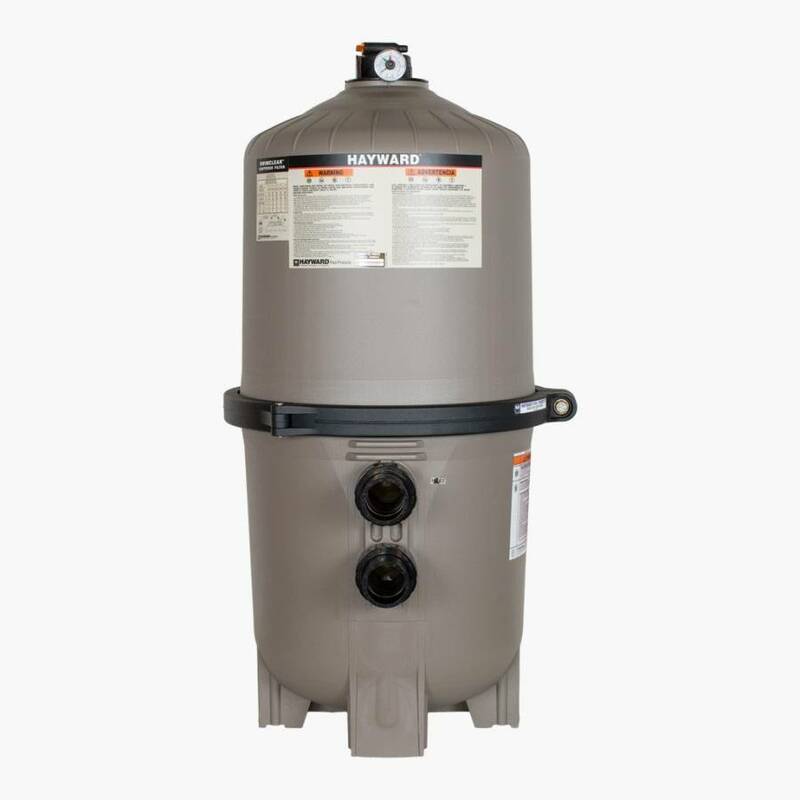 PermaGlass XL filter tanks made from extra durable glass reinforced co-polymer to meet the demands of the toughest applications and environmental conditions, including in-floor cleaning systems. Heavy-duty, tamper-proof, one-piece clamp securely fastens tank top and bottom. Allows quick access to all internal components without disturbing piping or connections. Non-corrosive top closure plate prevents elements from lifting and allowing unfiltered water to by-pass into pool or spa during operation. Quad-Cluster of high-quality polyester cartridge elements provide 225, 325, 425 or 525 square feet of filter area for extra dirt-holding capacity and long, long filter cycles. PVC union coupling connection accepts 1 1/2" or 2" piping for plumbing versatility. Self-Aligned tank top and bottom make access to serving the Quad-Cluster cartridge elements fast and simple. Full size 1-1/2" integral drain allows for fast, 100% clean-out and easier flushing of tank.